This book is coming out at a time where school shootings have, unfortunately, become common occurrences in our lives. It’s hard to even imagine what being in one would be like, let alone losing loved ones. Suffice to say, this was a huge story for the author to try to tackle. 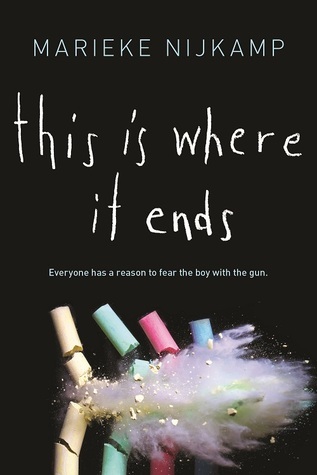 This Is Where It Ends tells the story of a school shooting through four different perspectives, all of who have some kind of relationship with the shooter. From these different perspectives, readers gain flashbacks that try to explain how the shooter got to this point. While they show that he was alone, abused, and grieving, there is still no answer as to why he decided to shoot up his old school. The cast is diverse, which is great. However, sometimes the author’s writing made the characters merge into one voice. The writing was very lyrical, which annoyed me at times. It seemed as if the characters kept spouting out metaphors every which way and that made them seem older than high school students. Even made it a little unbelievable. It’s not that I didn’t not like the book, it’s just that I didn’t like it either. The book was neutral to me. I didn’t really feel anything more for the characters that were dying than that this should never happen, which is terrible. I wasn’t connected enough to the individuals to feel sadden by their deaths, even though the author tried to make that possible with a one-to-two sentence explanation of that character’s life before they died. There were two characters’ deaths that I was sadden by, and they were main characters. Overall, I just don’t know what to say. People will love this book, and people will hate. I don’t know if I can recommend this one. Aw, that’s too bad. I was looking forward to starting this one. I think I’ll still read it, but your concerns make me feel like i won’t like THIS IS WHERE IT ENDS. I dislike it when authors try to make a book’s characters diverse just for the sake of being diverse, like it’s not even a part of the character. 🙁 Will approach with caution. Great review! I know, I was bummed too. Let me know what you think once you read it! I’d love to hear your opinion (even if it differs from mine). And, thank you! Oh no! I had really high hopes for this one. It looks like I might borrow it, instead of just buying it. Maybe you’ll end up liking it more than it did. 🙂 Thanks for stopping by! School shootings are a rough spot for me, and I think that is because I have kids in school.. So I don’t know how much I would want to read this. Your review is fantastic though, I think you need to be able to really relate with someone before you can feel for them. Hm. I’ve read this book too, and I see your points. I did like this book, and I’ve cried a lot about it. But you do make relevant points. Good review! I’m glad you liked it, Wren! I liked some parts, but there were other parts that fell a little flat for me.